Part of the AfterSchoolTreats.com family of creative enrichment websites! Young gardeners sometimes have trouble planting small seeds. They blow away; they drop out of your hand; you sneeze, and they go every which way. Kid-planted seeds sometimes grow up in a chaotic mess, with 52 plants in one square foot, and 2 plants in the other 20 square feet. Of course, that's an exaggeration. But successful gardening has to be more efficient than that. Crowded plants don't bear well, so there's a lot of waste if you have to thin a lot of misplaced plants out, or extra work if you have to transplant them where there is more space. And plants that are too far apart are just asking for trouble in the form of weeds. So to help kids plant an organized and therefore happier garden, you can make a seed tape. You don't really use tape, such as Scotch tape or duct tape; you use thin toilet paper. It forms a guide for where the children should place seeds, to keep them in an orderly pattern. 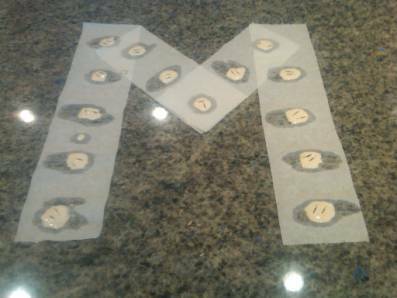 Two marigold seeds in each "blob" on a seed tape that forms an "M."
enough paste to get the seeds to stick. You can work inside, in advance of planting day, out of the wind, and it really helps kids with their seed spacing. 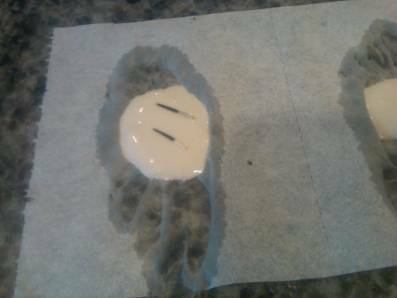 Do this on the floor if you don't have table space, in a spot that you can leave the seed tapes overnight to dry. Mix the flour and water together, just enough to make a paste, with the consistency of a thick glue. Have the children unroll enough squares of single-ply toilet paper to form the initial of their first name: "A" for "Andrew," for example, could be formed with four squares for each side, and two squares for the crossline. Be careful: the toilet paper is easily ripped. Now each child can "paint" a small, thin blob of flour paste in the middle of each square of toilet paper, using the craft stick. The blob should neither be too thick nor too thin - about the size and width of a dime. When that's done, the child can sprinkle two or three seeds into that blob of paste. even when dry, the toilet paper may tear when it is picked up. But: it worked, so oh, well! Let dry - preferably overnight. Next day, you may find that you need a thin spatula to lift up each paste blob without tearing the t.p. 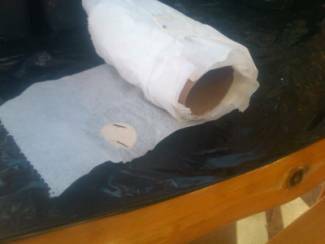 Carefully roll up the "seed tape" when dry, on an empty cardboard toilet paper or paper towel tube for each gardener. Mark the gardener's name on the end of the tube. These can store for weeks, or can be planted the next day. It's up to you . . . and the spring weather in your area! to keep them straight at planting time. plants come up and form their initial letter. At planting time, make sure the soil is loosened up, raked, and free of clods, rocks and twigs. It can be slightly moistened, but not wet. It's always a good idea to toss some new compost onto a gardening plot and rake it in to mix with the soil. Be sure to take a "before" picture of each seed tape at this point. With clean, dry potting soil rubbed between two hands, each child can cover the seed tape with a fine dusting of dry soil - just enough so that the toilet paper can no longer be seen. Follow up with a light sprinkling of water that is more like a spray than a downpour. Over the next few weeks, the toilet paper will decompose - that means break down - and become part of the soil. But the seeds will sprout, given sun and rain or watering, and grow in a pattern to form the child's initial letter. If two or three seeds come up together, once the plants are about 3-4" tall, the children can use small scissors to snip away and discard all but one plant in each grouping. They planted more than one seed in each toilet paper square in case that one seed didn't germinate. But you don't want to overcrowd your plants. Once the flowers have blossomed, take "after" pictures of each child's creation, and share. Well-organized: that's just how you planned it, with the seed tape. In fact . . . you had it on tape! Copyright ©2019 KidsGardenClub.org. All Rights Reserved.